I am happy to announce that my editor (i.e. 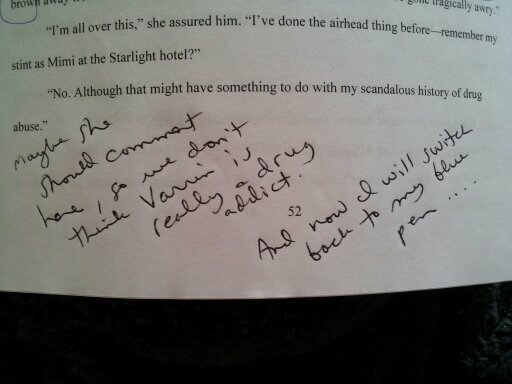 my mother) has returned the latest draft of Chasing Nonconformity back to me, full of comments and ready for revisions! Upon going through said comments, I found some of them quite amusing, and thought I might share them with you here today. This is part 1 of the images — part 2 will be posted tomorrow — so make sure to come back and see the second half of her excellent and insightful commentary. Also make sure to check out the caption on each photo for context. [SPOILER ALERT] The following images contain snippets of text from the Chasing Nonconformity manuscript. Don’t scroll down if you don’t like spoilers! 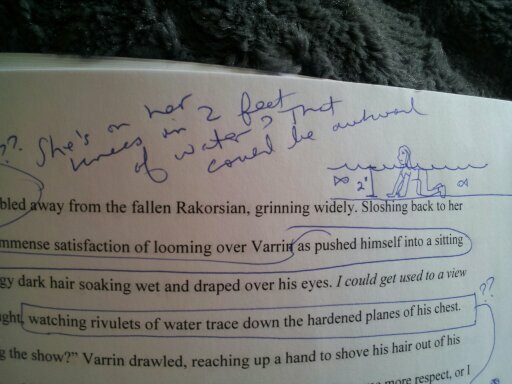 Mother kindly illustrates a scene for me in order to demonstrate … something. Mother gives me her life story at the start of chapter 3. 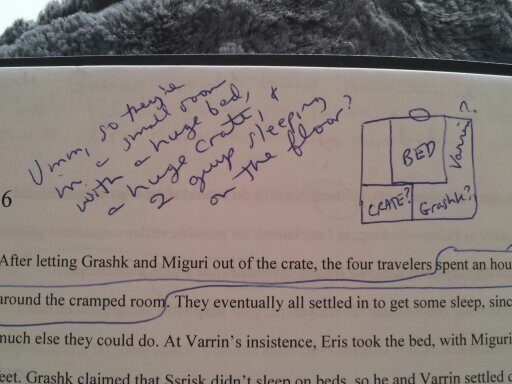 Mother illustrates her current editing situation. Mother gets sassy, and then explains the sudden and alarming switch in pen color. 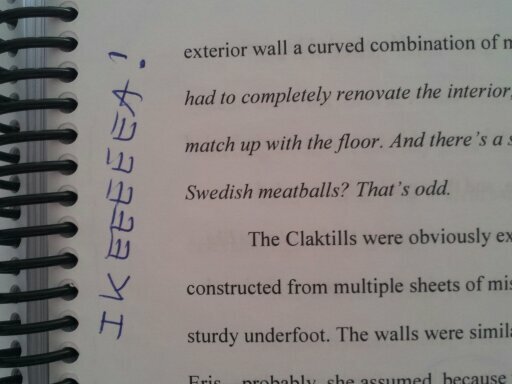 Mother gets really excited about a furniture store upon a mention in the text of Swedish meatballs. Mother takes issue with my description of a room. Mother is alarmed by flying eyebrows. Mother illustrates an awkward water situation. Oh, your mother is hilarious. I bet life never got boring growing up. 🙂 Lucky you, Michelle, to have such a cool mom. Good luck with your revisions. 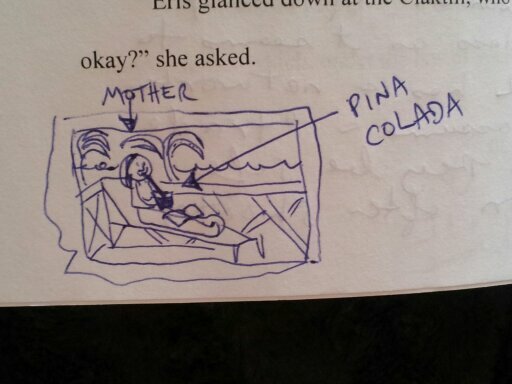 The Pina Colada picture is my favourite, looking forward to part II. Hehehe. I think she’s just rubbing it in my face that she got to go to Cuba and I didn’t. I love the comments! Does she take commissioned work? She must know the rocket scientist. They have the same color pen. it is so much nicer than red, I think 🙂 Too funny. I want to see those eyebrows fly skyward. Haha. You may yet see eyebrows flying skyward — I’m pretty sure I had that phrase in there a couple of times, and I don’t think mom caught all of them. Even though I’m not around much right now, I couldn’t resist this post when it showed up in my email. What a way to start my day – with a smile on my face. Your mother is fantastic. Those are the type of edits everyone would love to have! Haha. Of course, I left out all the comments about “this doesn’t make any sense”, “this sentence is awkward”, “why would she do this?” etc. But there were a few gems in there, which I pulled out just for you 😀 Glad you enjoyed them! 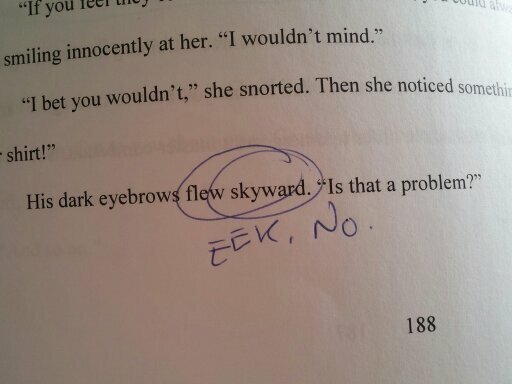 Skies above, I wish I had an editor like this! I may have to learn to draw—your mom’s edits are a riot! And you thought you knew all the copy editing symbols, Candace. Sometimes I wonder if she draws these because she knows I’ll get a kick out of them later, or because she legitimately needs to draw them in order to sort things out in her head. I’m thinking it’s a little bit of both, lol. Hahaha everything I know, I learned from my mother. Which is in fact far more alarming than it otherwise appears. Well, that sounds perfectly reasonable to me! Then again, my logic influx matrix recently cracked, and purple banana gargle salmon. xDD Oh, you’re too much, you are. 😉 Gargle salmon right back atcha! 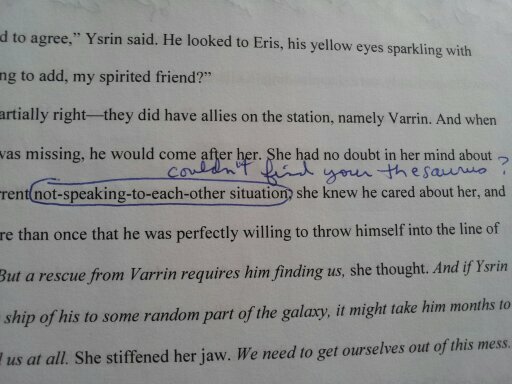 One of my favourite parts of writing – the reader response! 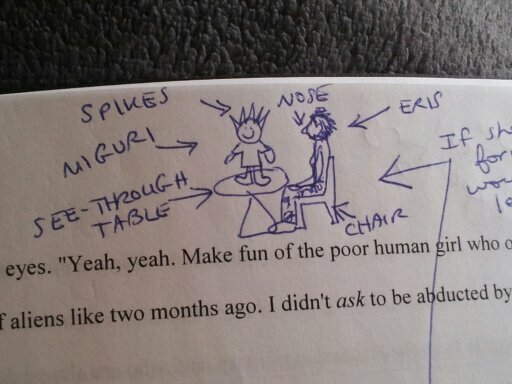 Here with some amusing examples from Michelle Proulx’s trusted reader, her mother. Excellent stuff! Love the little drawings. Thanks for sharing. 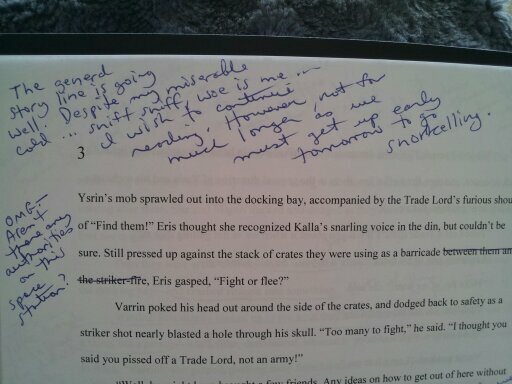 Wish I had these on my manuscript edits – makes editing much less tedious!